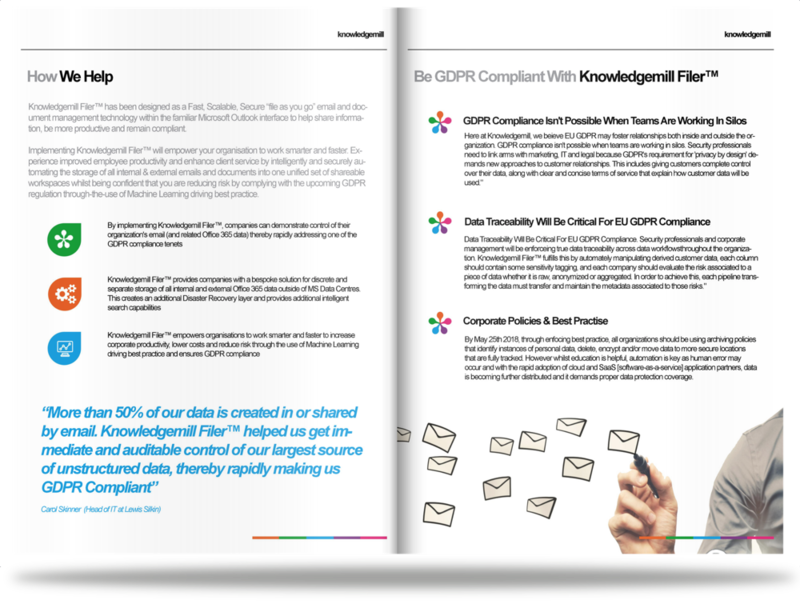 Knowledgemill ensures that all emails and documents are filed into its central and secure repository for access by all, with user rights and permissions ensuring that the right people access the right content. It is one version of the truth containing all emails and documents in real time that can be categorised and retrieved within seconds. The documents and emails combined view ensures that emails provide missing commentary on documents so that your can see how and why decisions were made. It is searchable by users, groups, clients, domains, projects, time periods and content and all emails and documents remain long after the employee has gone or a team has moved on. Knowledgemill also allows real time management review with low impact and footprint of all correspondence entering and leaving the organisation in a structured fashion. In turn, this tends to improves quality of communications as colleagues think before they send. All emails and documents filed in a structured and secure way in outlook and easy to search, find and retrieve within seconds. Emails provide missing commentary on documents. Search by users, groups, clients, domains, projects, time periods and content. Emails and documents remain long after the employee has gone. User rights and permissions ensure the right people access the right content. Real time management review with low impact and footprint of all correspondence entering and leaving the organisation in a structured fashion. What are you doing to prepare for GDPR? Have you begun implementing processes to ensure you are compliant? Our latest free Download, Preparing for GDPR with Knowledgemill Filer™, explains how implementing Knowledgemill Filer™ empowers organisations to work smarter and faster to increase corporate productivity, lower costs and reduce risk, whilst creating a sustainable, governed data asset for GDPR and beyond.